Stephen Collins Foster penned some of America's most enduring songs. This exquisite book offers stunning piano/vocal arrangements of 10 favorites from the Foster library. 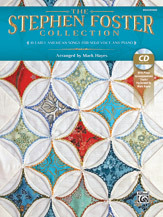 Mark Hayes adds his touch to this quintessential repertoire for recitals, concerts, and contests. Titles: Beautiful Dreamer * Camptown Races * Gentle Annie * The Glendy Burk * Hard Times Come Again No More * Jeanie with the Light Brown Hair * My Old Kentucky Home * Oh! Susanna * Slumber, My Darling * Some Folks.